As we already know that Anushka Sharma produced one of her film i.e NH10 and now again she produced Phillauri s quirky and lots of fun film which she was starring in it. Set in Punjab, the film traces the story of a ghost (played by Anushka Sharma) who is married to a living person (Suraj Sharma) after he was asked to marry a tree before getting married to his fiancee as he manglik. Anushka, the ghost haunts Suraj and his fiancee (Mehreen Pirzada) and they discover she has an unfinished business of her own. The story moves to a flashback in which Anushka Sharma seems to be in a love with a budding musician played by Diljit Dosanjh and something went wrong in their love story. In an interview, Anushka Sharma told once that the story is about “Wedding in the movie is just the backdrop of the story. Phillauri has got shades of drama, craziness and really interesting characters. It is romantic, fun and at the same time very intriguing. The story is set in Phillaur district of Punjab”. Of her co-stars Suraj, Mehreen and Dijit, Anushka Sharma said: It is a fresh casting. 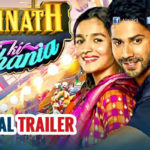 Suraj, Diljit and Mehreen Pirzada have added newness to the film with their personalities because they are not set in their ways. It’s a fascinating world, quite different from the colorful, contemporary setting that the trailer starts with. Phillauri, directed by Anshai Lal and produced by Clean Slate Films and Fox Star Studios. Phillauri releases on 24 March. Anushka Sharma had shown the trailer to members of the film industry over the weekend, and they had all tweeted lovely things about it. In a one of a kind marketing ploy, Anushka Sharma released the trailer while on a live Facebook chat.